i really love paper goods. when i came across sara's lovely shop, i immediately fell in love with everything. her cute map bunting, mini gift tags, map journals filled with vintage ledger + graph paper: all my favorite things! visit her shop and you can follow her on twitter too! Hello! Please tell us a little about yourself! Hello! My name is Sara and I'm originally from the Bay Area but am currently going to school to study architecture in Los Angeles. I also like to ride bikes (I just built a shiny new purple one) and drink tea when I'm not making new cute things for my shop! How did you get started making your lovely paper products: I really love old vintage maps and found paper. I always had a huge collection of them, but was never quite sure what to make with them, let alone create a shop around them. I'm kind of a notebook fiend...buying little notebooks all the time without really knowing what I would use them for at the time. I figured I could easily make my own notebooks with recycled and repurposed materials that I had on hand, and from there I started up my Etsy shop, saratops. Your shop was started within the last few months and is doing so well! Any advice for new shop owners: Make sure you really love to make the items that you are selling! To be successful you'll really need to put a lot of work into your shop. Being dedicated to your shop and working to help it grow will be much easier if you truly enjoy making the items which you are selling. with your favorite item from sara's shop. tag it with @ohhellofriend so i can track your tweet! leave a comment letting me know which site you follow for an extra entry! and the perricone $150 giveaway in a couple more days, sorry for the delay! The vintage flashcards are awesome! I love the recycled map notebooks!!! 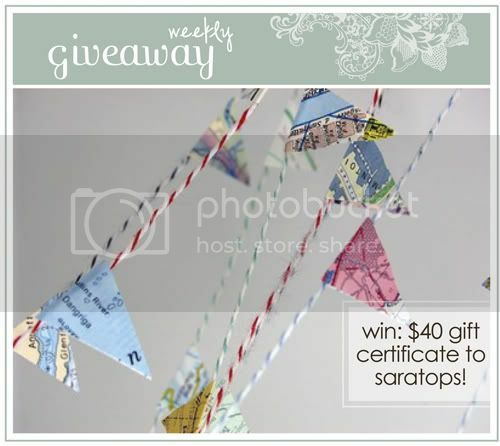 Great Etsy shop and great giveaway! I also am a Facebook fan AND a Twitter follower! I love the book page garland! So sweet. I am loving the flashcard notebooks. Great giveaway! Ok I must win this giveaway, it will be PERFECT for my son's first b-day I am currently planning. My fav item is the recycled map gift tags. I am blog follower and FB fan! I love the library card notebook! There are so many awesome things to choose from, but I LOVE the Recycled Book Pages Garland! The vintage flashcard notebooks are awesome and so is the adorable garland! I already love this shop from loonnnggg time ago! I hope random.ord will pick my number. 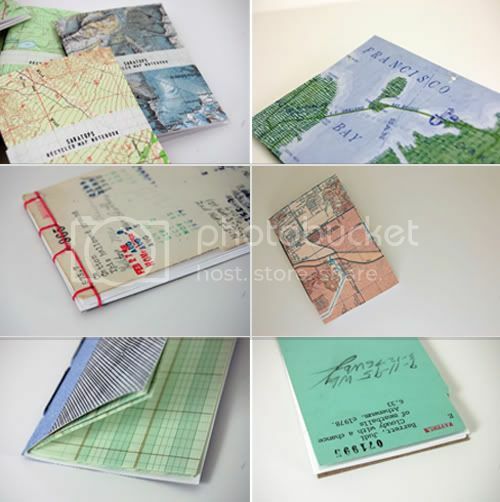 "Recycled Map Weekly Planner" is my fav listing saratops! The buntings are soo sweet! i am your twitter follower. I am so sorry to hear about you mom, hope the treatment will help her and that she'll recover just fine. Sending you and your mother lots of heartfelt thoughts! I love the recycled map garland!!! I love the recycled map gift tags! i love old maps so it would be hard to choose just one item - my first pick would have to be the recycled map weekly planner. love that. Hadn't yet discovered this nice shop! You could better ask what I don't like, that would be easier. But if I had to pick it would be the Recycled Map Weekly Planner. Thanks for another great giveaway. I love the carnival ticket gift tags. What a great idea! Anything made from a flashcard is a winner in my book. i LOVE the recycled map garland, it's soo unique! thanks for a chance to win! love the recycled prize ribbon! all of her notebooks are inspiring! I love the recycled map garland! Oh my goodness, I love it all. The mini library card notebooks are my favorite! Oh! My favorites are the library card notebooks. So cute! just shared this giveaway on FB!! It was tough, loving the Recylced Map Bunting Notecards, but I think the Recycled Map Garland is my fav! My favorite is the recycled map prize ribbon! I really love her shop. Truthfully, I love them all, but the Recycled School Paper Garland would be my top choice! Thanks so much for a chance to win! I also liked ohhellofriend on facebook! I'm a blog, twitter, and facebook fan. Love these beautiful handmade paper products! I love the old bingo notebooks but I am also a huge fan of the map bunting notecards, they are so cute! Lovely stuff, I really like the Carnival Ticket Gift Tags! Oh my goodness...I love all of it! I can't even pick a favorite. Such adorable items and I love that you recycle so much paper into beautiful items! fabulous. Hmmmm I'm loving the vintage map notebooks... so much fun to take notes in that lil book! I love love love the map bunting! Hope all is going well with your mom/family. Treatments for any ailment can be stressful. there are way too many cute paper goods to choose from. But if I must my top faves are the recycled map garland and the recycled map prize ribbon-calgary. I love everything in the shop too, but at the top of the list are the mini library card notebooks and the recycled map bunting. I love Love LOVE the prize ribbons! Could they be more perfect?! I love the Chatsquot Mountain Recycled Map Notebook. I would love the prize ribbon! so hard to pick because everything is super cute! I really like the recycled map garlands!! the book page garlands, definitely! What a lovely little shop. Everything is absolutely darling. My fave would have to be a tie between the recycled map garland and the recycled map prize ribbon. So fun! First, healing thoughts to your mother. Second, love flashcards - fun to see them in a notebook. I definitely love every single item in that etsy shop! but if I must choose one, I'd go for the recycled map notebooks. Want to enter the giveaway. and I'm a twitter follower! and finally, yes, I'm a fan in facebook. left you a comment there. loving the book page garland! what adorable and well photographed art! i LOVE the map garland! ;) so cute! i love the recycled map notebooks!!! omigosh I'm so glad you featured this shop - so much good stuff! But since I'm a librarian, I have to say that my favorites are the mini library card notebooks. so cute! Thanks for another amazing giveaway! I have my own Etsy shop that centers around vintage papers and ephemera, so I completely LOVE absolutely everything in Sara's shop! The recycled map prize ribbon is adorable and I've never seen anything like it, so that's probably my favorite! I like everything in the shop but I really love the recycled map weekly planner and the recycled map garland! Oh, my...I am in love with that map bunting. Adorable. p.s. You're blog makes me happy. I'm a follower on blogger and facebook and I couldn't be happier about it. I love the Library Card Notebook and recycled map weekly planner. I like the library card notebooks - so clever! Also, I follow Oh Hello Friend on Facebook and google reader. i love the Carnival Ticket Gift Tags!!! i hope i win! So pretty! I love the cute City Recycled Map Notebooks! Lovely idea. I love the 9 plus 8 Vintage Flashcard Notebook! The mini library card notebooks are just too adorable! I am a follower on Twitter (mahalmichelle) and a fan on Facebook (Michelle Huynh). The recycled city map journals are my favorite. Great shop. I love the recycled map notebook...great giveaway! I'm so glad that I came upon your blog today, it's very lovely! The Recycled Map Bunting Notecards are super cute! I love the recycled map weekly planner, its great! And I would be a facebookfan, if i could find you, is there a link or something? It pretty much sings my name. I hope I win! Good luck to Saratops, I plan on visiting her often. The store is full of lovely things. It's hard to pick one. My instant favorite is the map recycled notebook. The city map journals are my favorite! love, love. I love the vintage map weekly planner - it combines so many of my favorite things into one! I really like the vintage flashcard notebooks! Follow you on GFC, too. I fell in absolute LOVE with the Recycled Map Weekly Planner! i LOVE all things map-related and bunting as well! the map garland is definitely my favorite. I'm diggin' the "9 plus 8 Vintage Flashcard Notebook"
I've been crushing on the round security envelope stickers since your summer trade guide came out! i like the recycled map notebooks. cute! I like the unique recycled map notebooks. Very different! I like the library card notebook. I love love love the Mini Library Card Notebooks!!! Who knew cuteness could be so simple. What a beautiful shop! I love the garlands and the library card notebook. I really love the map bunting! Thanks Danni! oh i love it all!! but particularly the bunting and flashcard notebooks... just lovely!! p.s - im a follower! I'm in love with the map notebooks. love the map prize ribbon-so cute- great colors! i LOVE the map bunting! soo pretty! I lovelovelove the weekly planner because you can start it at anytime and it would work perfectly for school! I'm a sucker for bunting ... I love the Recycled Book Pages Garland! PS I'm sending prayers up for your Mom ... as well as healing vibes. I love the recycled map notebook! What a great giveaway! i love the recycled map gift tags. so cute! her paper goods are really cute! i can't decide which one i like more: library card notebooks (set of 2) or woodland topography recycled map notebooks (set of 3)! I love the map prize ribbon. I've always liked maps, but I would never have thought to use them that way. I love the bunting cards. I don't know what it is, but the bunting on paper is just precious. Oh, the gift tags are adorable and the map garland is fabulous. I can't get enough of your wonderful blog and love following you on twitter and facebook! I would love to have the library card mini notebooks...what a darling idea! I miss card catalogues, but the library in my small town still date-stamps everything and it makes me smile. :) I love sara's shop! Thanks for the great find. I think I will tweet this, too! p.s. I will be thinking of you and your mom. May you both be blessed in little surprising ways through this time. love the recycled map notebook. so cute! thanks for doing this! I also follow you on twitter. big hugs for you & your mom. I really love the security envelope stickers. those are neat! my favourite is the recycled book page bunting! I'm a follower on blogger and facebook. I love those flashcard notebooks. the recylced map garland is heavenly sweet, and i know exactly where i'd hang it. i love the planners and journals! i love the map covered weekly planner! what a cute way to be organized. p.s. danni, your mom is in my thoughts and prayers! i love the bunting note cards. i'm a sucker for cute stationery! I adore the Woodland Topography Recycled Map Notebooks!!! So cute and clever! from her shop is mine is "Recycled Map Notebook - Sweet Home!" Love the recycled map garland - may try some here at home with stuff I have laying around! Lovely shop - thanks for the intro to her :) AND the chance to win! I am a follower ! :) **** I totally adore her shop! It's so unique! love, love, love the vintage flash card notebooks! I love the recycled map notebooks!! So cute! the recycled (upcycled) map garland is my favorite. i love art created from maps and library tags. great shop! Love, love, love the recycled map garland! Papergoods make my heart melt. Not even joking. Oh, and I follow on facebook and twitter. LOVE the map garlands! Thanks for the chance to win. xo!